AEGEAN President Eftichios Vassilakis, Pratt & Whitney Senior VP of Sales, Marketing and Customer Support, Rick Deurlooof and AEGEAN CEO Dimitris Gerogiannis. 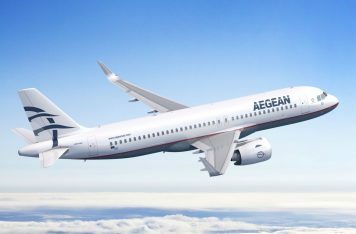 Greek airline AEGEAN on Wednesday signed a Memorandum of Understanding with Pratt & Whitney to power up to 62 Airbus A320neo Family Aircraft with GTF Engines. 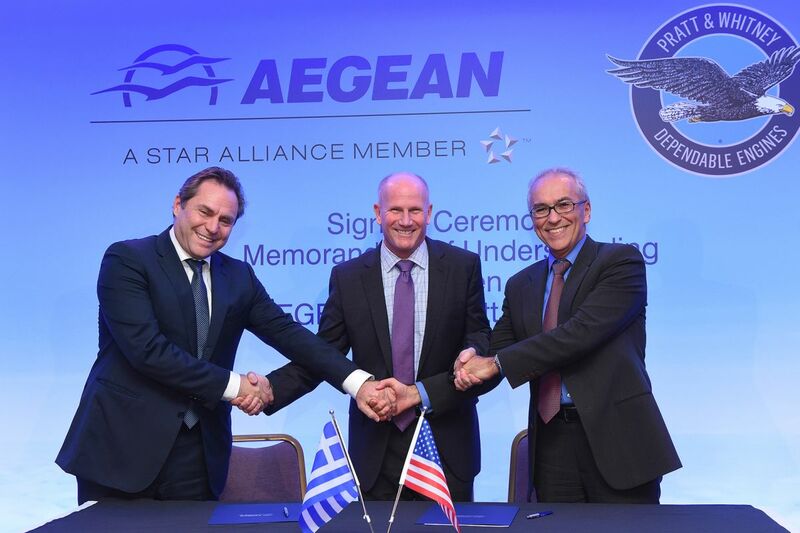 The MoU was signed in Athens by AEGEAN President Eftichios Vassilakis, AEGEAN CEO Dimitris Gerogiannis and Pratt & Whitney Senior VP of Sales, Marketing and Customer Support, Rick Deurlooof. The Ambassador of the United States in Greece, Geoffrey R. Pyatt, attended the signing ceremony. Through the signing of the MoU, AEGEAN expands its existing partnership with Pratt & Whitney, which already powers the airline’s fleet of 49 A320ceo family aircraft with V2500 engines. According to Gerogiannis, the selection of GTF engines opens a new chapter in AEGEAN’s long-standing partnership with Pratt & Whitney, which dates back to the airline’s beginning in 1999. “Our aircraft will be powered with the most advanced technology engines,” Gerogiannis said, adding that the agreement is expected to offer a substantial improvement in AEGEAN’s efficiency through reduced fuel consumption and optimization of maintenance costs. GTF engine is the most cost-effective and environmentally friendly available option in the market. Since entering into service in early 2016, the GTF engine has demonstrated its promised ability to reduce fuel burn by 16 percent, to reduce NOx emissions by 50 percent to the regulatory standard and to lower the noise footprint by 75 percent. 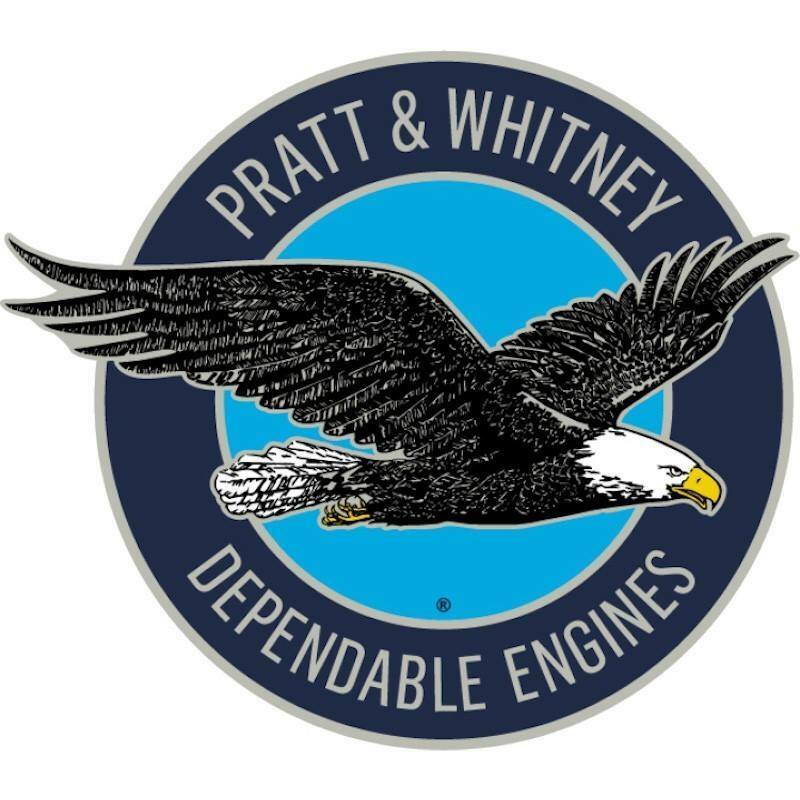 “GTF engine has revolutionized the technology in the aviation industry and will provide AEGEAN with proven performance and environmental benefits,” Pratt & Whitney’s Rick Deurlooof said. “We are honored to power and support AEGEAN’s new fleet of A320neo family aircraft, he added.